Deep in Egypt’s Nile Valley, a team of archaeologists are excavating an ancient site. Then, among the mummified remains of animals and birds, they discover something different buried in the dirt. There they uncover the mummies of long-dead humans which have been hidden beneath the ground for 2,000 years. In 2016 a team of students from Cairo University traveled to Tuna al-Gabal, a village in central Egypt. Once part of the ancient city of Hermopolis, this settlement on the edge of the desert guards a vast treasure trove of fascinating archaeological finds. Previously, researchers had discovered a large necropolis in the region. This site was home to thousands of mummified animals such as baboons and falcons. Moreover, two human tombs were uncovered. One belonged to a priest, the other to a young woman who had died in tragic circumstances back in Roman times. Clearly, Tuna al-Gabal was a site of some importance. However, nothing could have prepared archaeologists for what they found next. Using radar, the Cairo University team subsequently began scanning the site, hoping to discover other secrets that lay buried there. Incredibly, what they ended up finding was one of the most important archaeological discoveries that the region has ever seen. When their radar revealed a substantial chamber underneath the ground, the team began an extensive excavation beneath the village. Finally, in May 2017, the researchers revealed their amazing find. After digging down some 25 feet, they had discovered another necropolis. Yet rather than housing the mummified bodies of animals, this burial chamber was filled with human remains. It’s the first human necropolis to be found here in Tuna al-Gabal,” Khaled Anani, Egypt’s Antiquities Minister, said in a May 2017 interview with NBC News. However, it turned out that the discovery wasn’t just unique within the village. Indeed, as archaeologists began to delve deeper, they realized that they had stumbled upon a once-in-a-lifetime find. So far, at least 17 ancient mummies have been discovered in the Tuna al-Gabal necropolis. The site contains the bodies of men, women and children, all laid out in a remarkable state of preservation. What’s more, experts believe that the chamber could contain around 30 sets of human remains in total. According to Anani, the mummies that have been discovered to date were preserved in an elaborate fashion. Apparently, this suggests that they may have belonged to high-ranking people such as priests and officials. Yet despite this, the find is still thought to be the first time that such a large amount of “ordinary” citizens – rather than royalty – have been found mummified in a catacombs setting. Journalists who subsequently visited the site reported that one part of the catacombs was filled with piles of human bones. On each side, the chamber was lined with mummies. And apparently, while some of them were interred in wooden or stone sarcophagi, others were simply laid out one on top of the other. 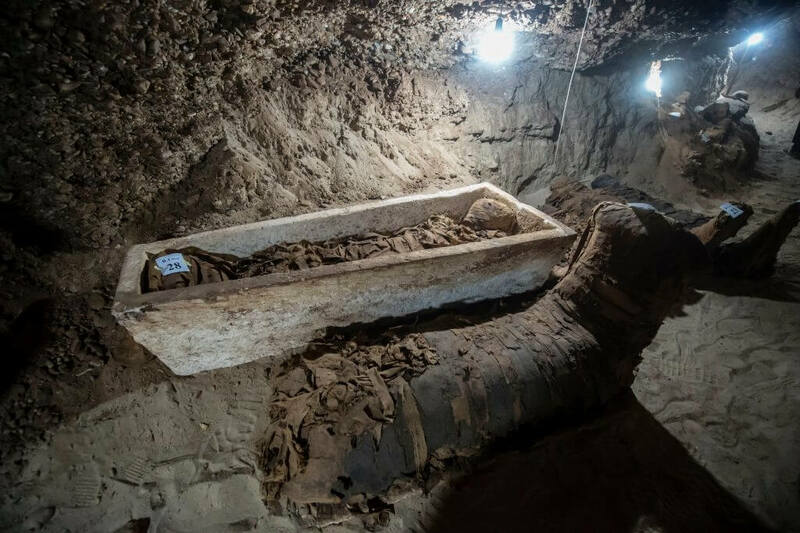 A side view the mummies and sarcophagi, archaeologists also discovered two coffins made from clay and two papyri – a type of document found throughout ancient Egypt. However, while most early Egyptian tombs contain writing in hieroglyphs, these papyri featured something different altogether. Instead, they appeared to feature Demotic script, a type of writing thought to have developed out of hieroglyphics. In fact, Cairo University’s dean of archaeology, Mohamed Hamza, believes that these latest discoveries date to a time known as the Greco-Roman period. The period is thought to have spanned some 600 years, beginning in 332 B.C., when Egypt was colonized by the legendary Alexander the Great. This event heralded the era of Greek influence on Egyptian history as well as a time of much upheaval. That said, not everyone agrees with Hamza’s theories about the origins of the mummies. For example, according to a spokesperson from the Egyptian antiquities ministry, they could actually date from the Late Period, which covered the three centuries before the arrival of Alexander the Great. Yet whatever the truth behind the mummies, there can be no doubt that the authorities will welcome the boost they may bring to the country’s struggling tourist industry. In the past, millions of holidaymakers visited Egypt annually to marvel at ancient sights such as the Giza Pyramids, which are the only surviving Wonder of the Ancient World. However, in 2011 all that changed. An uprising led to the deposition of unpopular leader Hosni Mubarak and catapulted the country into a period of great instability. With Egypt’s political troubles sometimes erupting into violence, then, tourists have been staying away from the country in their droves. Now, Anani hopes that discoveries such as those made at Tuna al-Gabal can pave the way to a brighter future. “I believe and trust that the most interesting thing that will bring the entire world’s attention to Egypt and improve its image is any news relating to antiquities,” he told The Telegraph in a May 2017 interview. Meanwhile, work at the Tuna al-Gabal site is continuing apace. Indeed, when journalists visited the location, they were told that excavations were merely at a preliminary stage. What’s more, some reported seeing the extremities of new mummies poking through the edges of the catacombs, which suggests that there is still much to be revealed. The more we drill, the more we find,” Anani continued. “The excavation did not end yet, it’s in the beginning.” And with experts already lauding the discovery as being one of a kind, the world of archaeology waits with bated breath to learn what else lies hidden beneath the Nile Valley.